Army Officer Candidate School (OCS) is a 12-week program which graduates commissioned officers in the United States Army. Beginning in World War II, Army OCS was established to provide infantry officers for the war effort. OCS has remained an important commissioning source for the Army, along with Army ROTC and the U.S. Military Academy. OCS is located at Fort Benning, Georgia. All OCS graduates must serve a minimum of three years on active duty. Only about 60 percent of all those who apply are accepted for attendance at OCS. Civilian college graduate and current military candidates do not compete with each other for available OCS slots. College graduate applicants are chosen by a selection board convened by the Army Recruiting Command, and current military personnel are selected by a board convened by the Army Personnel Command (PERSCOM). Once selected, the graduation rate for OCS is over 90 percent. To be eligible to enroll in OCS as a civilian college graduate you'll need to be able to meet the normal requirements of enlistment. OCS applicants need a four-year degree from an accredited college or university and must be U.S. citizens. You also should be able to qualify for a secret security clearance from the Department of Defense (although may not need to actually obtain the clearance until after graduation). A minimum score of 110 on the general technical (GT) segment of the Armed Services Vocational Aptitude Battery (ASVAB) tests also is required. Like any other Army recruit, you must meet height and weight requirements and will have to pass a physical at a Military Entrance Processing Station (MEPS). The application process begins by talking to an Army Recruiter. In the Army, OCS candidates must enlist for the purpose of attending Army Basic Training. Once you pass the above criteria, and it has been reviewed for correctness by the Recruiting Battalion, you will be scheduled to appear before the Recruiting Battalion OCS Board. The board is composed of at least three commissioned officers. The board will question you on personal history, training, and experience. Each board member will make an independent appraisal of your overall qualification for a commission. If the board recommends rejection, you will be so informed. The processing ends at that point. If the board recommends acceptance, the results are sent to the Army Recruiting Command OCS Review Board, which does the final approval, and determines OCS class date. Once the review board approves the application, you will be enlisted in the Delayed Enlistment Program (DEP) and given a basic training class date. These soldiers must have the same ASVAB score and citizenship status as civilian college graduate candidates. 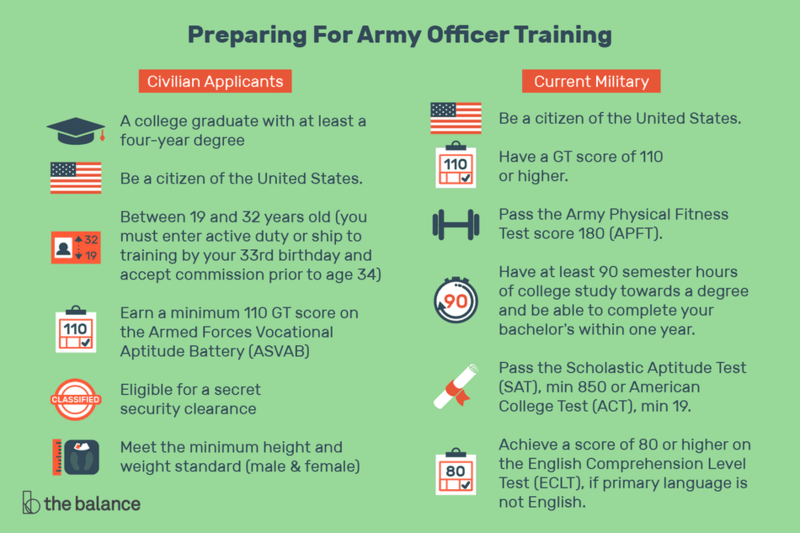 If you're an enlisted soldier and don't have a college degree, you may be required to take the Scholastic Aptitude Test (SAT) or the American College Test (ACT). You should be on track to complete your bachelor's degree within a year of enrolling in OCS. a 60 in each area). You'll also need a score of 80 or higher on the English Comprehension Level Test (ECLT) if your primary language is not English. And you should have no convictions by civil or military courts. Note: You can't apply for OCS until after you've completed advanced individual training (AIT). Active Army warrant officers or enlisted members who have completed AIT and reported to their first permanent duty station may apply. Soldiers assigned to overseas commands may apply at any time. Former commissioned officers may apply if their only commissioned service was performed in one of the Armed Force's early commissioning programs for students in the health professions. Commissioned warrant officers, warrant officers and enlisted personnel of the USAR not on active duty may apply. Warrant officers and enlisted personnel of the Army National Guard of the United States (ARNGUS) may apply as prescribed by the Chief, National Guard Bureau. For current military personnel, check with your chain of command about applying for OCS, because you'll need their support. Your application form, along with supporting documentation (college transcripts, waiver requests, letters of recommendation) are sent to the unit commander who reviews and approves the application. The unit commander then passes the application package through the intermediate commander (for review/approval) to the Installation Commander. The Installation Commander convenes an OCS structured interview. This process is conducted by three commissioned officers who will evaluate the applicant's performance and application materials, which includes a writing sample. If approved, the Installation Commander passes the application through the MACOM commander (who can also approve/disapprove), who forwards the package to Army PERSCOM (Personnel Command), where the package is reviewed by an OCS selection board, who makes the final selections. The PERSCOM board selects the branch at the same time the OCS package is approved. All Officer candidates must complete Basic Combat Training before they enter OCS, where they will be focusing their education and training on small unit leadership and tactics. OCS is divided into two phases. The basics of being a commissioned officer are taught in the first phase of OCS. This will include training the officer candidate in leadership and accountability. Being an officer requires responsible and capable people working together as a team. This phase focuses on testing those abilities. Phase two is the testing and evaluation phase, which requires the candidate to use all of the skills learned and put them to the test in the field. Officer candidates are tested leading a team during an intense 18-day training mission. In general, the Army allows the movement of dependents at government expense if the length of training (at a single location) is greater than 180 days. Candidates will have limited access to family members for at least the first seven weeks or so of OCS. After that weekend passes are conditional until entering the senior phase when restrictions are relaxed a bit. After OCS, a newly commissioned officer will attend Basic Officer Leader Course (BOLC). This is a three-phase training program designed to provide initial military training for junior commissioned and warrant officers in both active and reserve components.